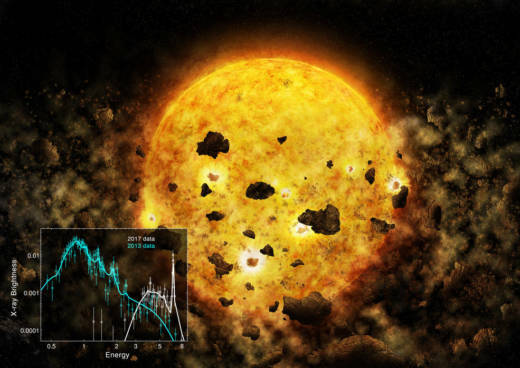 Astronomers may have caught a relatively nearby star munching on a planet or mini-planets. A NASA space telescope noticed that the star suddenly started looking a bit strange last year. The Chandra X-Ray Observatory spotted a 30-fold increase in iron on the edge of the star, which is only 10 million years old, along with pronounced dimming. Astronomers have been watching the baby star — in the constellation Taurus — for decades and iron levels weren’t high in 2015 the last time the Chandra telescope looked at it. The star, called RW Aur A, is 450 light-years away. A light-year is 5.9 trillion miles. “We’ve never seen any star that’s changed its iron abundance like that,” he said. Guenther said one potential simple explanation is that the star is eating a planet or mini-planets. He looked at other possible explanations, and of the two that make sense, he prefers the planet-munching one. Computer simulations show it can happen, but it has never been seen before, he said. “This could be an exciting discovery, but the evidence is circumstantial and not definitive,” said Harvard’s Avi Loeb. Guenther’s preferred explanation is speculative, said Alan Boss of the Carnegie Institution of Science, an expert on planets outside our solar system. The study is in Wednesday’s Astronomical Journal.